I was all set to write an "Around The ECHL" post today to round out the week. But I honestly couldn't find anything. Either I'm really out of touch with the ECHL or there just isn't anything relevant out there to report on. Except for one thing. Remember when The Hockey News kicked off their knockoff of NHLToL? Apparently they're down to their final 8 logos this week — the Elite 8, if you must. Yeah, they even have a clever little graphic to go with it. We can let this serve as our ECHL news for the day. The Florida Everblades (my local team) and the Ontario Reign — ironically, they're from California — are in this special group. The Everblades beat out the Pittsburgh Penguins and the Reign topped the Minnesota Wild, shockingly. It's worth checking out the rest of the bracket. Should Icethetics hold a THN-style tournament of logos? It sort of makes me want to do something similar to see if we'd end up with the same results here. Based on past experience, I highly doubt it. That means it's time for a poll. Off to the right there you cast your vote. Should we try a multi-league logo tournament similar to but not exactly like what THN did or would that just be a waste of time? Poll's open until Saturday at noon. I'm curious to see what everyone says. UPDATE (2:17 PM): NHL Jeff brought up a good point with his comments. A few ECHL teams have unveiled new logos, albeit not recently, but still worth mentioning. The South Carolina Stingrays have a new logo incredibly better than its predecessor. Easily one of my favorite new logos. It was unveiled by the team back in June. It also has a couple of nice secondary logos to go with it, plus a new 15th anniversary logo. I'll go into all of these in more depth in the Season Preview in a couple weeks. The Charlotte Checkers introduced a new primary logo — again, a huge improvement over what came before it. This logo is an anomaly because from what I've been reading it was introduced midway through last season — meaning the Checkers actually changed horses midstream. They, like the Stingrays, also had a 15th anniversary logo. And again, I'll talk more about all of this in the Season Preview. And then of course there's the Ontario Reign — the reincarnation of the Texas Wildcatters who were unable to stay in Beaumont. 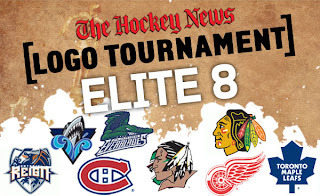 This logo is one of the final 8 in the THN tournament discussed above. It's a good logo, but better than the Wild? Really? And while I'm on the ECHL, I might as well mention a couple of things I found interesting. The Columbia Inferno have suspended operations this year because of arena issues but will supposedly return next year. And the Toledo Walleye will also begin play then — they're the former Toledo Storm which ceased operations when the city decided to build a new arena. It's all very confusing and strange. Stop playing for a year, then come back. Constant relocating. I think this is why I've never been able to get into minor league hockey.